Pick out a gift that will last, and last, and last for your Valentine this year. We’ve got a great 20% off site-wide Valentine’s Day sale on our most popular and protective iPhone 6 cases, MacBook cases, iPad cases and more. Read on for ideas of what to get your valentine! Your valentine is creative, unique, and always seems to find products off the beaten path. Give them something truly special this year with one of our newest CandyShell Inked CSA Images iPhone cases & Galaxy cases. Each of these military-grade protective designs were created in small batches, so the longer you wait, the more likely your favorite animal phone case or robot phone case will run out of stock! 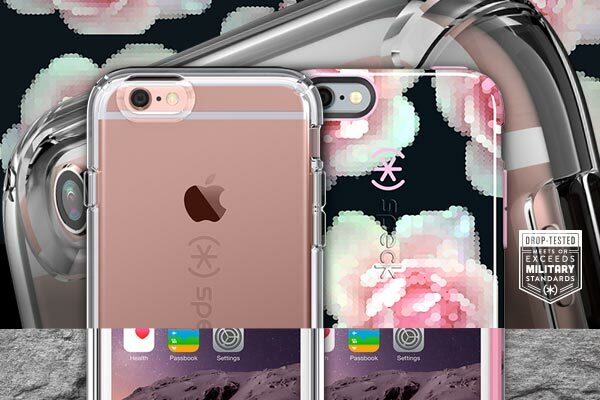 Don’t wait to stock up on these limited edition graphics cases. This type of Valentine doesn’t mess around with protection for their favorite devices. If you’re looking for the most protective iPhone case, or most protective iPad case, look no further. Our MightyShell + Faceplate for iPhone and DuraFolio for iPad are some of our toughest, military-grade protective cases for your indispensable Apple devices. Don’t skimp on protection – your sweetheart deserves a case that can fall, fall, and fall again. Looking for cute iPhone 6 cases that protect your sweetheart’s device at the same time? Whether they’re looking for a case to match their coaster set or flower vase, our CandyShell Inked Jonathan Adler iPhone cases are sure to please. We’ve also got dozens of ways to personalize your laptop with our protective hardshell MacBook cases. From pinks to blues and everything in between – and don’t forget our bestselling CandyShell Clear – you’re sure to put a smile on your valentine’s face with this present. If your valentine date has enough workout clothes to dress a yoga studio, consider getting them some serious protection for the devices that carry their music, track their pace, and calculate their distance. Our Apple Watch cases are perfect for protecting athlete’s Apple smartphone with a fully raised bezel, and our iPod Touch cases pack the same military-grade protection you trust for your smartphone – and still let you rock out. For the no-fuss, no-frills date, get them protection that will not only last – but will look good in their briefcase. All of our Samsung tablet cases offer sleek, all-around protection in hues that say, “we’re ready for business.” And for a colorful pop of professional protection, be sure to cruise through our selection of protective MacBook covers. Finally, a black tie look wouldn’t be complete without our completely clear military-grade CandyShell Clear iPhone 6 case. Rest assured, this gift will crack a smile.